One primary reason to obtain a power of attorney is to have someone else manage your financial affairs, for example, if you are going on extended vacation, or if you need to devote energy to more important tasks than routine financial transactions. Thus, you could issue one to enable someone to pay bills for you or even buy and sell property in your name if that is an area of your business you no longer want direct oversight over. Because agents can wield so much power over your finances, it is important to select someone you trust. The agent should understand your financial goals and consult you or other business partners occasionally regarding your finances. 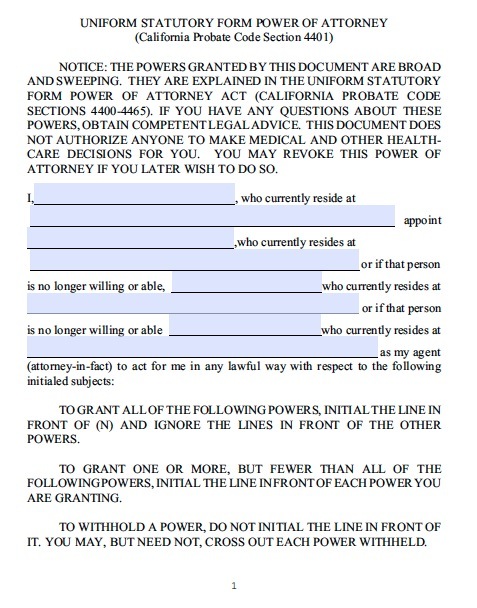 Episodes of power of attorney abuse exist, for example, when an agent uses a principal’s money for the agent’s benefit. In California, a notary must sign the document and attach the notary seal for the document to become valid. If the principal would not like for the powers to be legal if she or she should become incapacitated, they should refer to the general version.